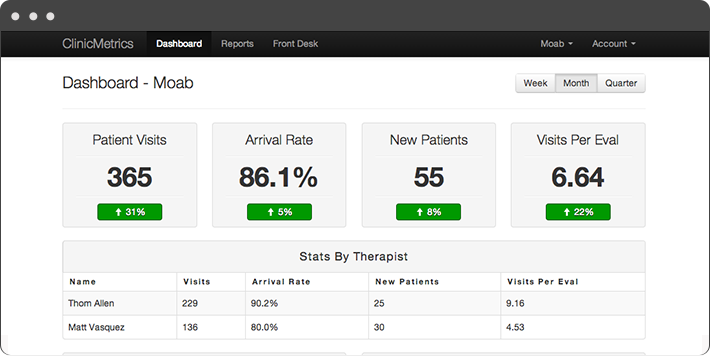 Use ClinicMetrics to see the health of your physical therapy practice in seconds. Sign Up Get one month free! Stop wasting visits. Improve clinician productivity by monitoring progress together in real-time. Get more new patients without spending more money by seeing what marketing efforts are really working. Save time and feel good. See your entire business in one place without frustrating spreadsheets or outdated systems. Do you really know what's going on in your business? Most practice owners still track and monitor their business metrics using Excel or outdated software. Even worse, some aren't tracking at all. Huge Time Sink—Manually entering data and preparing reports is tedious and makes it impossible to have the information you need to make informed decisions. Lost time and money—This leads to problems like wasted visits, lost new patients, and other headaches in your business that could have been prevented. Healthcare reform—With rates being slashed and changes to healthcare, its critical to become more efficient. We surveyed over 1000 practice owners and heard the same story over and over. So we pulled together to build something that will solve these problems for you. ClinicMetrics shows you the health of your practice in minutes per day. See your metrics across your entire business in real-time from your computer, tablet or mobile phone so you can stop problems before they happen. Critical metrics like visits, arrival rate, revenue and cost per patient (and many more) are available to your entire team instantly so you can make smart decisions, make more money, and have less headaches in your business. ClinicMetrics keeps everyone on the same page and shows you who’s doing a good job so you can reward them and who needs support. Set goals, watch progress together and grow. Make profitable decisions and be in control of the future of your practice. Any question you have about your business data, ClinicMetrics can help you answer. Our customizable reports let’s you look at the details over time so you can analyze, problem solve, and drive profits— without all the overhead of crunching numbers manually. Discover what marketing efforts are working and which ones are not, analyze your payer mix, forecast for the future to predict profits, make confident hiring decisions. ClinicMetrics pays for itself with one more new patient (but you will get lots). Be in control of the future of your practice today. Fast and dead simple to use. ClinicMetrics is crazy fast and easy to use. You will be setup in minutes and your team will be tracking and seeing data right away. The modern design can save you hours per week. Entering data, and creating new reports takes seconds. Everyone's practice is different so we built ClinicMetrics to be fully customizable so you can track what is important to your business. With technology, problems are inevitable. We’ve got you covered. You will always be able to talk to a real person over the phone or email and we’ll resolve your issue the very same day. We believe that long term contracts are obscene. Pay per month for ClinicMetrics with no ridiculous setup fees. Upgrade, downgrade or cancel at anytime. Our pricing is simple, what you see is what you will get billed—no hidden costs. If you are not thrilled with our service, we do not want your money. We will refund 100% of your payment for the month if you are unsatisfied for any reason. Would you like to see if ClinicMetrics can help your practice? Awesome. You can try ClinicMetrics for one month free. All you have to do is fill out the form below and we'll be in touch.